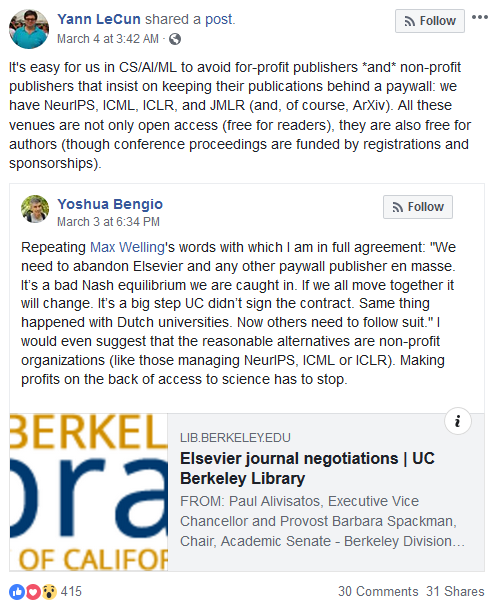 The University of California has halted all further subscriptions with one of the world’s largest scholarly publishers, Amsterdam-based Elsevier. The move follows more than six months of negotiations which failed to reach a substantial agreement on securing universal open access to UC research. The split is part of growing push in the machine learning community for free and open public access to its research. The UC’s 10 campuses produce a massive amount of research papers, and some 18 percent of these end up in Elsevier publications. The UC also pays millions of dollars annually in subscription fees for Elsevier journals. Print publishers traditionally own the rights to the articles in their journals, and charge anyone who wants to read or use them via subscription or other fees. However, with the rise of the Internet the game has changed. It no longer makes sense for researchers to pay for a publishing platform that locks out many potential readers. 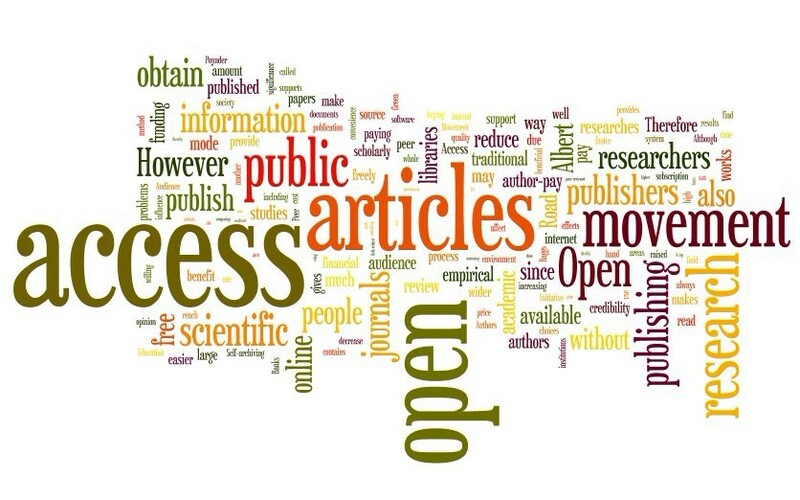 Elsevier is not the only for-profit publisher affected by the open access movement. 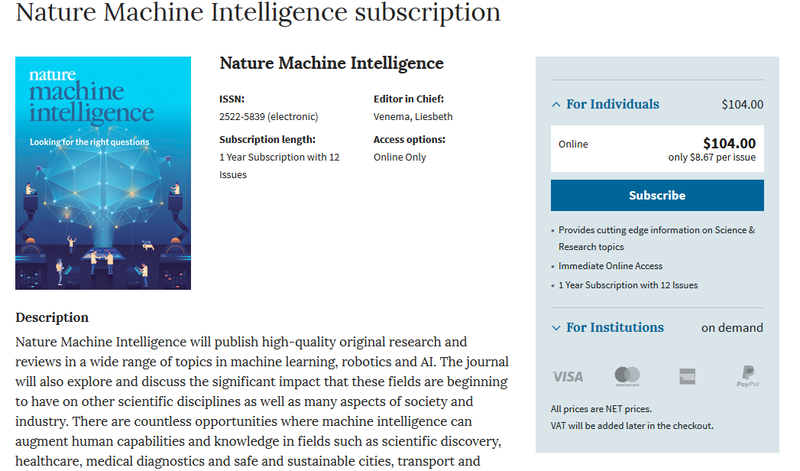 In late 2017 popular scientific journal Nature came under fire after announcing plans to debut a new online-only publication, Nature Machine Intelligence (NMI), ”for research and perspectives from the fast-moving fields of artificial intelligence, machine learning, and robotics.” Thousands of machine learning researchers signed a petition pledging to boycott the new journal: “We see no role for closed access or author-fee publication in the future of machine learning research and believe the adoption of this new journal as an outlet of record for the machine learning community would be a retrograde step.” Prominent AI researchers Yoshua Bengio, Samy Bengio, Geoffrey Hinton, Jeff Dean, Ian Goodfellow, Gary Marcus, Sergey Levine and others said they would not submit any papers, reviews or editorial services to NMI in protest over its paper submission fees and individual and institutional subscription fees. The first issue of NMI went live in January free-of-cost, and Nature says it will remain free through 2019. There are a growing number of non-profit publishers now providing public access for machine learning research, and Synced has compiled a list for your reference. The UC’s termination of subscriptions with Elsevier may be a major turning point in the fight.